Until recently, Pichet Ong was the pastry chef behind The Spot Dessert Bar, my new favorite food destination in New York City. Chef Ong’s path to the culinary world is a quite unorthodox, to say the least. The self-taught chef has always had a passion for food, but his parents’ emphasis on higher education meant that culinary school was out of the question. He double majored in Math and English Literature and graduated Phi Beta Kappa from Brandeis University and earned his Master’s degree in Architecture from UC Berkeley. But, while getting his formal education, he continued to stoke his passion for food by working part-time at restaurants, including at Chez Panisse while he was in graduate school in Berkeley, CA. His cooking experiences eventually led him to New York and the kitchens of a couple of Jean-Georges Vongerichten’s restaurants, where served as consulting pastry chef for 66 and Spice Market. Under Vongerichten’s mentorship, Ong honed his skills in bringing Asian and Western techniques and ingredients together to create some unique and inventive desserts. This recipe is from Ong’s cookbook, The Sweet Spot: Asian-Inspired Desserts, published in 2007. This cookbook features recipes which feature traditional Asian ingredients with fun twists. Condensed milk is popular in many Asian countries. As a child growing up in the Philippines, I often ate a version of milk toast, toasted white bread drizzled with a generous amount of condensed milk, only with pan de sal, a Filipino bread roll. 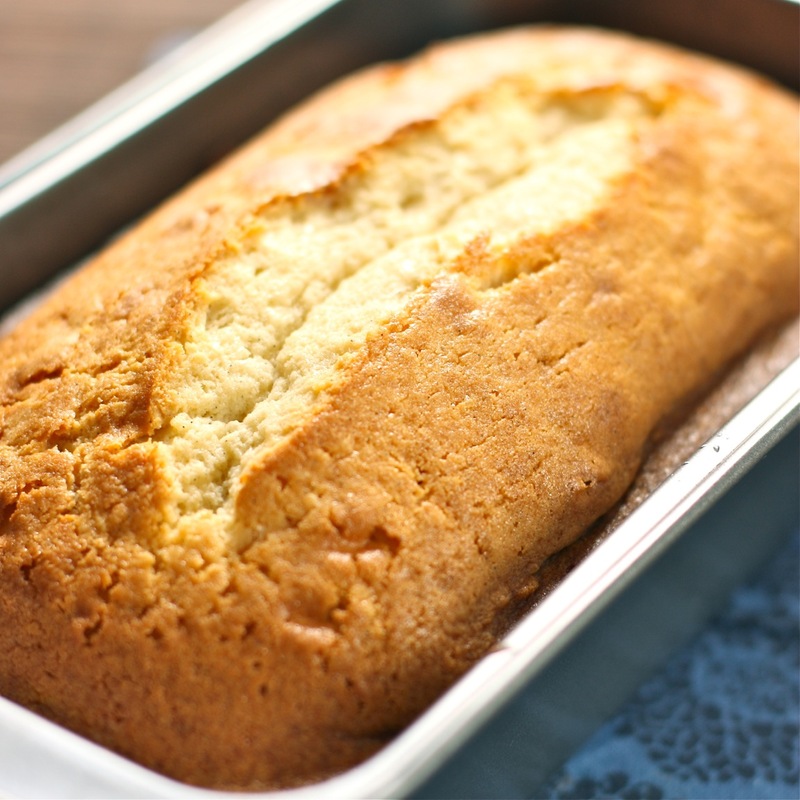 This pound cake reminds me of my childhood snack, with the condensed milk conveniently baked right in. This cake was easy to make, especially since it uses a food processor to mix all the ingredients for the batter. The pound cake was moist, and had a tight crumb. Despite being dense, it did not feel heavy at all. Serve a slice with some raspberry jam or some strawberries and cream and a cup of tea. Me, I drizzled a little bit more condensed milk and chocolate sauce and reminisced about my childhood. Preheat the oven to 350 degrees F. Butter the loaf pan completely and set aside. PUt the sugar and the chopped vanilla bean (if you’re using it) in the bowl of a food processor fitted with the metal blade. Pulse until the vanilla bean is finely ground. Strain the vanilla sugar through a fine-mesh sieve and return to the food processor. If you’re not using a vanilla bean, place the sugar in the food processor. Add the butter and salt to the food processor and process until the butter and vanilla sugar are light and fluffy, about 2 minutes. Scrape the sides and bottom of the bowl and then add the condensed milk and pulse until well incorporated, about 15 times. Scrape the sides and bottom of the bowl again and then add the flour and pulse until it is incorporated, about 10 times. Add the eggs and pulse just until combined, about 4-5 times. If you’re using vanilla extract, add it now. Mix by hand using a spatula to make sure the batter is fully mixed. Pour the batter into the prepared loaf pan. Bake until a tester inserted in the center comes out clean, about 55-60 minutes. I baked mine for exactly 1 hour and I found it a tad over baked. Other bloggers who’ve made this cake have reported baking times from 60 to 80 minutes. Next time, I would test for doneness at the 50-minute mark. Cool cake completely in the pan. 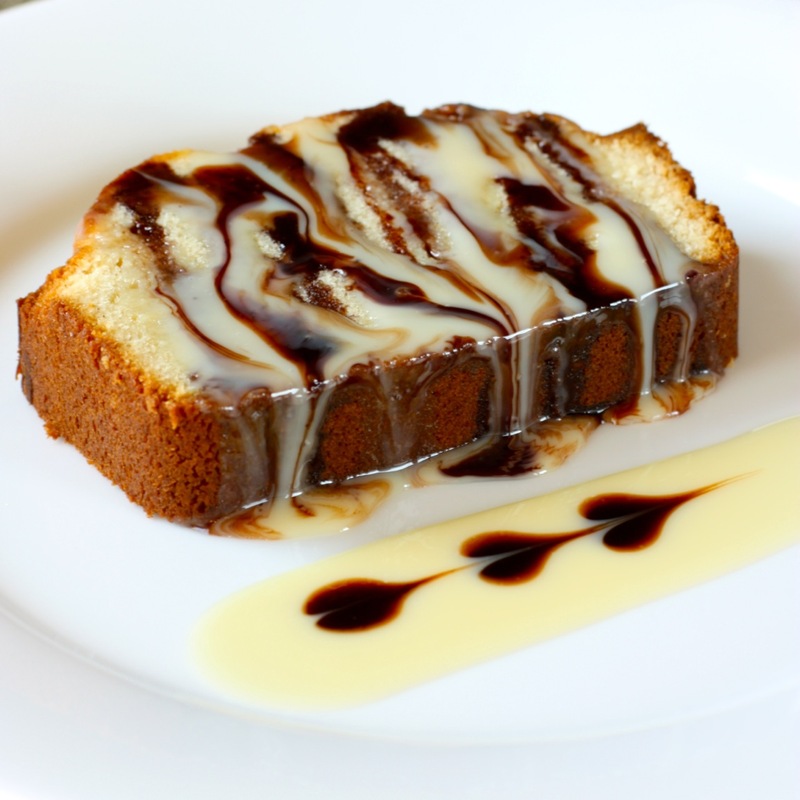 To serve, drizzle more condensed milk and chocolate syrup on the cake slice. Oh my!!! This looks delicious!!! I must try this one. Thanks so much for allowing us to feature your amazing recipe on The Answer is Cake. Such a fabulous cake! This is such a must do recipe which i chanced upon. Done it twice n both times turned out superb in flavour, though very much oily with the bottom of the cupcake liner soaked in oil. I live in a tropical climate, think that’s the reason? It might be. I’ve only made it as a loaf and I haven’t ever encountered that problem. Perhaps I will try to make cupcakes next time and see if I get the same results. …just saw your Kim’s comment. I have your recipe on my post with link-back to your webpage…still giving you credit and diverting traffic back here. If this is an issue, do let me know…so I can delete accordingly. Daisy… your cake is positively stunning!! photos, recipe and your content. They posted my content without permission and I wanted to make sure that you knew yours was there as well just in case you have not granted permission. Daisy, this is literally making my mouth water. I must try this recipe! I’ll report back. I love anything with condensed milk. Yumm, thanks. This looks soooo rich and decadent Daisy. One slice of this and I’d be in heaven! And in the Caribbean we eat bread and condensed milk as a snack too. We call it “bread and milk”. When I came to the US, and told my new friends about this, they were totally disgusted. Didn’t matter to me. I loved bread and milk all the same! Yum. Since I ate all the pound cake, I just drizzled the condensed milk on a piece of hawaiian sweet bread. People don’t know what they’re missing…. A simple and great loaf, and what a difference a topping makes! Gorgeous. While the pound cake is good by itself, I do tend to get carried away with the toppings. What can I say, I love sweets. This looks and sounds divine – am passing on to my husband, the baker 😉 And I am going to try out the dessert ‘Spot’ in NY too. PS I like the note about Architecture from UC Berkeley. That’s what Julius Shulman should have taken!!! PPS The milk toast sounds really good. i would love to go the the Philippines. Thanks! I kept meaning to get to Brooklyn on my trip, but didn’t make it. I have Toby’s Estate on my list for next time. I’d love a flat white from an authentic Australian shop. I hope you do try Spot. It’s very charming. I wish I had a chance to try more of their desserts. I’d love to hear what you think of the place. That’s good to hear about Toby’s being a first stop – if you like them on facebook, you’ll see what they’re up to – to help in planning! I will try Spot for sure – my husband has a sweeeeet tooth and Urth Cafe made us matcha addicts. So that lava cake is a must when we go! Looks soooo good. Think I’ll try this today. Thanks Daisy! Looks beautiful with your swirled topping. Sounds easy. and it’s sweet, just like I love it…. OMG Daisy. That looks so amazing. And I bet it’s so moist from that sweetened condensed milk!